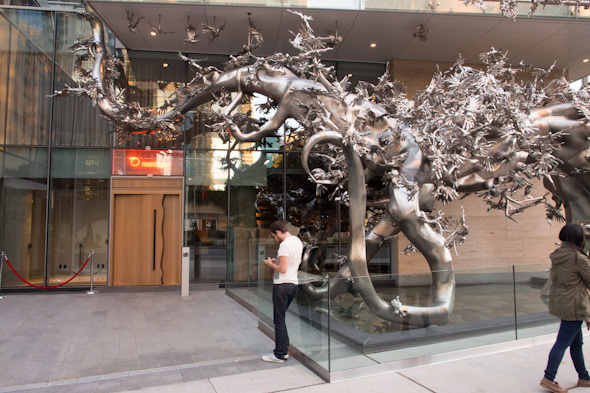 Momofuku Toronto has finally opened its doors after a summer full of eager anticipation. 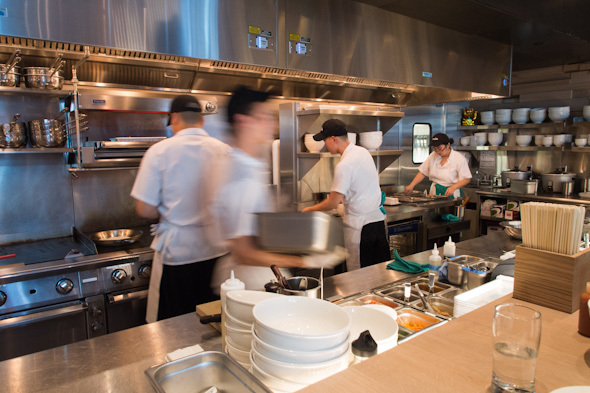 The Noodle Bar, from famed, New York chef David Chang, is the first of three restaurants that are soon to include Shōtō, a 22-seat restaurant that will mimic the concept of New York's Ko with 10+ course tasting menus; and Daishō, a larger, 70-seat family style dining room. The Noodle Bar, on the first floor of the Shangri-La Hotel is a casual, but polished, cafeteria styled eatery. The cavernous ceilings open to the second floor cocktail bar, Nikai (which literally translates to 'second floor') and gives an illusion of space – don't be fooled, in true Momofuku style; the long, communal tables are packed in so tight that you can hardly pass between fellow diners. 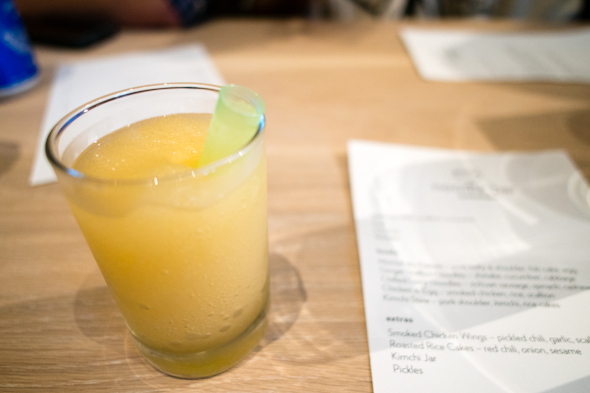 You should also be prepared to meet your neighbours which I find kind of fun and can make ordering much easier: "I'll have one of those..." and suddenly I've got a super refreshing yuzu, lime and sake blended Seven Spice Sour Slushie ($10 for the large or $5 for a wee, shooter-sized 'small'). 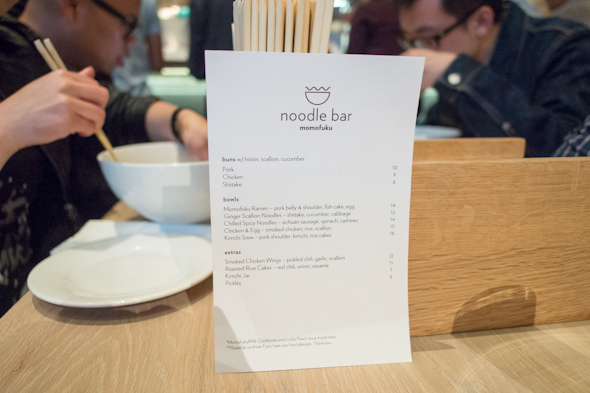 Unlike the New York Noodle Bar, the Toronto menu features only a dozen selections which arrive as they're ready and in no particular order. 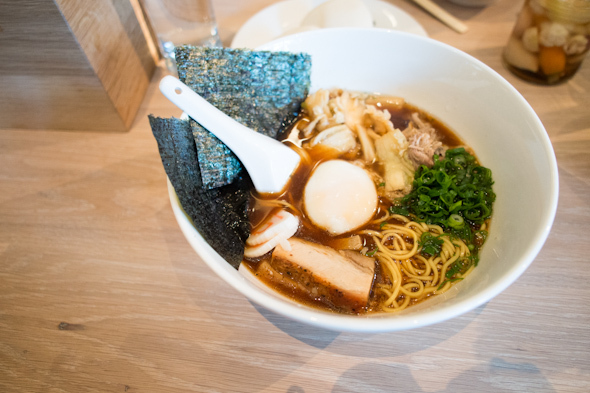 My choice, the Momofuku Ramen ($14) is a hearty bowl of bouncy, chewy noodles topped with pork belly and shoulder, fish cake, scallions, kimchi, nori and a perfectly soft-poached egg. The broth is the product of slowly simmered kombu, chicken necks and scallions, and for me, is impressively seasoned (read: not-too-salty). 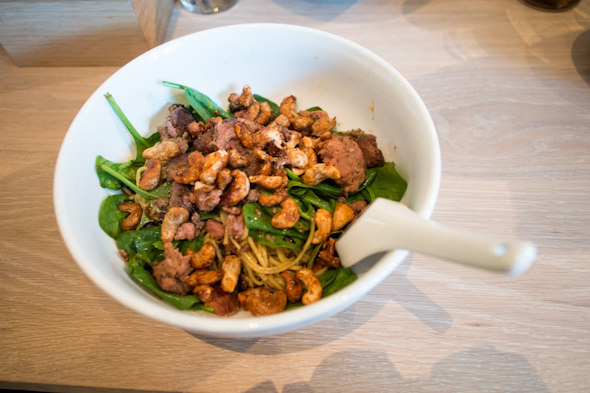 The Chilled Spicy Noodles ($14) comes topped with sichuan sausage, fresh spinach and candied cashews. When we ordered it, our server noted its heat - though upon tasting, we all agree it was kind of tame. 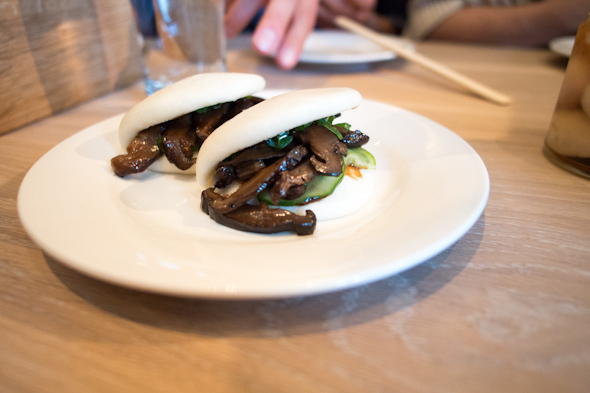 Despite Chang's notoriously public, pro-pork stance there are vegetarian selections like the Shiitake Buns ($8) with hoisin sauce, scallions and cucumber, as well as, the Ginger Scallion Noodles ($12 - top photo) that come topped with shiitakes, cucumber and cabbage. The Roasted Rice Cakes ($11) are my favourite of the night. 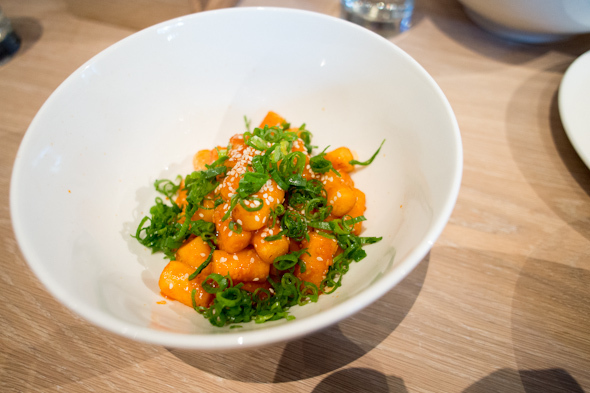 The bowl of chewy, gnocchi-like dumplings come dressed in bibim sauce, sesame oil and toasted sesame seeds and are mildly addictive. Clearly a Chang dish. 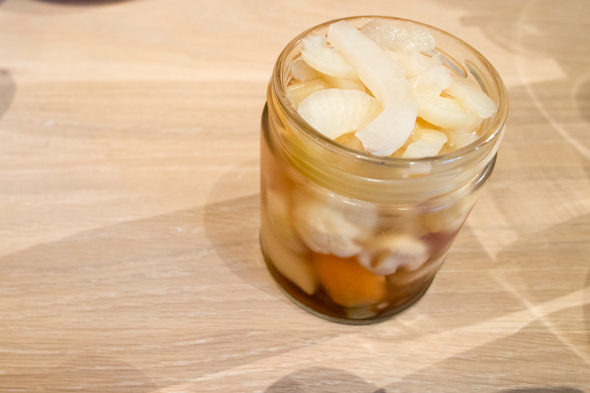 The jar of mixed Pickles ($6) offers refreshing crunch and I'm happy to have it on the side. 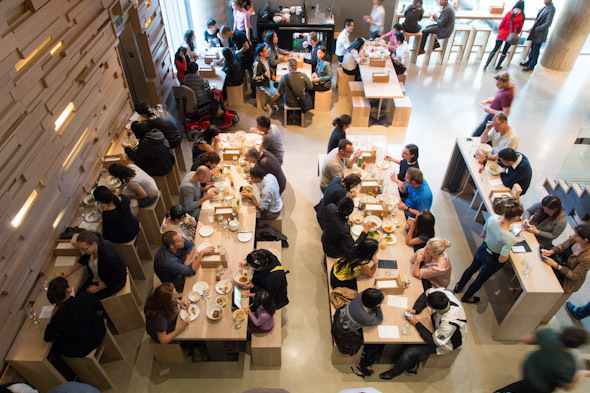 The freshness and heartiness of this kind of food make Momofuku's success obvious. Caught up in the excitement of it all, we may have ordered too much food and we left before the notion of dessert even crossed my mind... now I can't stop thinking about the signature Milk Bar treats. Can someone, anyone: please report back – is crack-pie on the menu? Correction: An earlier version of this profile described the ramen broth as containing pork bones - it does not. 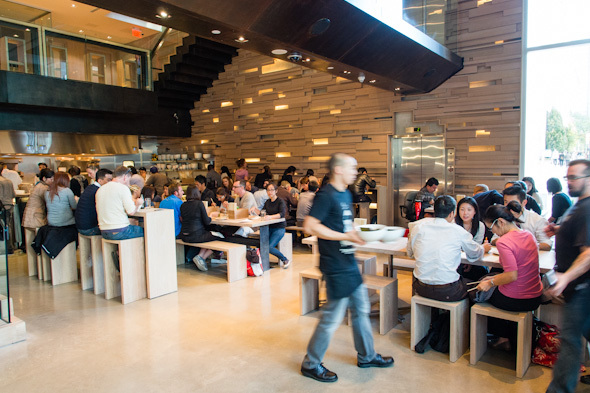 Momofuko has officially let us know that there are no desserts at Noodle Bar, not even crack-pie.